Thomas Aquinas College provides one of the best undergraduate educations in the country, according to The Princeton Review. 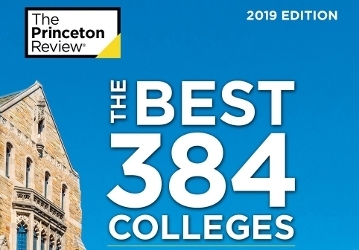 The education services company features the College in the 2019 edition of its annual guide, The Best 384 Colleges. Only about 15 percent of America’s 2,500 four-year colleges are profiled in the publication. Thomas Aquinas College is one of only three Catholic schools recommended by the Cardinal Newman Society to make The Princeton Review’s “Best Colleges” list. Among the ratings for Thomas Aquinas College are scores of 96 for academics, 94 for quality of life, and 99 for financial aid. Members of the College’s teaching faculty, likewise, earned scores of 98 for being both “interesting” and “accessible.” (In this scoring system, 99 is the best possible score.) The Princeton Review also named the College as one of just 10 schools nationwide on its Financial Aid Honor Roll.